GRAFTON: William E. Burke, 82, of Grafton passed away January 9, 2019 at UMass Memorial Medical Center in Worcester following an illness. He leaves his wife Jean A. (Dube) Burke, a son Michael of Auburn, daughter Allison Peck and her husband David of North Andover, three grandchildren; Brian and Emily Peck of North Andover and Anna Burke of Auburn. He was born in Grafton, son of the late Dorothy (Edwards) and Donald Burke. 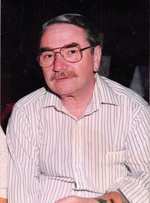 He was predeceased by his brother Irving Burke. He was an International Officer at Shawmut Worcester County Bank where he worked for 35 years and later at Worcester County Institution for Savings. He retired in 2001 from Morgan Construction Company. He was a member of the Retired Men’s Club of Greendale and volunteered at the Grafton Thrift Shop. There are no calling hours and burial will be private at his family’s convenience.